Closing my blogging activities for this year with a simple, clear, colorful Sankey diagram. This one is shipped with the demo version of e!Sankey 4 as a sample diagram. This is for energy flows (heat and electricity) in a hospital. Flows are in MWh per year. Natural gas is used to fire a steam boiler and two cogeneration (CHP) units. Heat is used directly for heating in hospital buildings (red arrows). 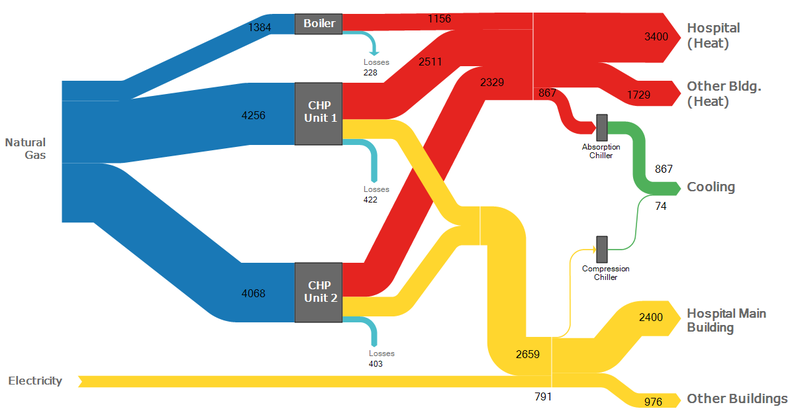 Power from CHP and electricity from the grid shown as yellow arrows.